Writing has been a lifelong endeavor for Patterson. 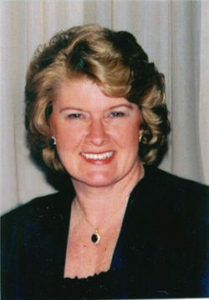 Therefore, with encouragement from her parents, her life path became clear and she pursued her love of the written word. Because of this, Karen A. Patterson uses her love of writing to share her thoughts with the world about restaurants, food and travel in a variety of books. She has also recently began writing a blog about her visits to restaurants across the state of Ohio. 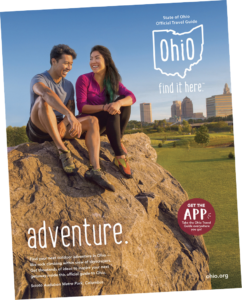 View the online version of the Ohio Travel Guide and turn to pages 26-28 to read my article about some of the best places to grab a bite to eat in Ohio! Recipes from Ohio’s Must Places to Eat. A collection of famous favorites from the Restaurant Travel Guide Eating Your Way Across Ohio. If the first book—Eating Your Way Across Ohio: 101 Must Places to Eat—whet your appetite for more from the Ohio eating and travel series, you’ll love the second book. 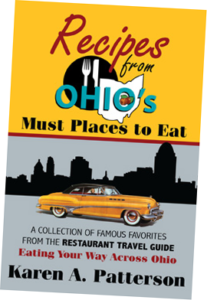 Recipes from Ohio’s Must Places to Eat provides more than 200 taste-tempting recipes from a variety of Ohio restaurants, along with a generous helping of old-time favorites from friends and family members. parents, the path for her life became clear and she pursued her love of the written word in many ways.